Pam Burnside Presents At IDB Caribbean Creative Conference In Washington, D.C.
Pam Burnside, owner of Doongalik Studios Art Gallery was recently invited to make a presentation on the growth of the Bahamian Visual Arts at the Creatives of the Caribbean Arts Festival based on the topic: “Fostering Economic and Commercial Viability of the Caribbean Creative Economy”. 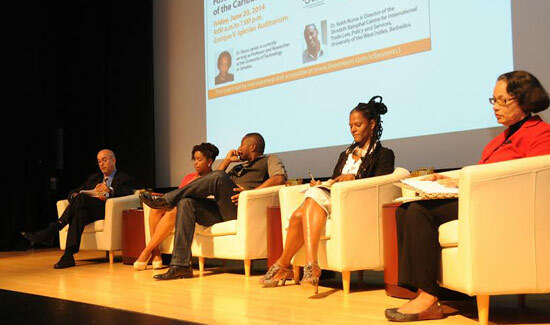 (iii) a panel seminar “Voices of Caribbean Creatives” to draw attention to the economic impact of the creative industries in the Caribbean, and to promote comprehensive development of this sector. The panel which Burnside participated in consisted of Marielle Barrow, Editor-in-Chief of Caribbean in-Transit, Ewan Simpson, Musical Arranger and Intellectual Property Lawyer, Dr Yanique Hume, Program Coordinator & Lecturer in Cultural Studies at UWI, and Pam. It was moderated by Ignacio De Leon, IDB Private Sector Development Lead Specialist. There was also a presentation from Dr. Keith Nurse on the Creative Economy and Entrepreneurship in the Caribbean followed by another panel consisting of Dr Diana Baird N’Diaye, Cultural Heritage Specialist at the Smithsonian Centre for Folklife and Cultural Heritage, Felipe Buitrago, Author of the IDB book The Orange Economy, Richard Campbell Chief, Culture and Tourism at OAS and Mario Umama, Integration and Trade Lead Specialist at the IDB who spoke on “Measuring, Preserving and Growing the Creative and Cultural Sector” from an development institutional standpoint. The seminar concluded with a key presentation by Dr. Vanus James, of the University of Technology, Trinidad and Tobago on “Measuring Economic Impact of the Cultural Industries” with recommendations of how the development stakeholders could support this process. In order to share the information with the Bahamian community, and as a part of their 40th Anniversary celebrations, the Central Bank of The Bahamas, the institution that can be regarded as one of the foremost incubators for much of the country’s visual arts development and progress, invites the public to attend Burnside’s presentation in the foyer of the Bank’s Gallery on Wednesday, July 23 from 6.30 pm – 8.30 pm. The evening promises to be an educational and entertaining one as Burnside, who is also a founding member of the Transforming Spaces annual Art Tour as well as the newly formed Creative Nassau organization, will examine the important role Creativity can play in the Bahamian context, and how it should be seriously embraced in its broader sense not only as an economic engine that can provide necessary employment opportunities for Bahamians, but also as a vehicle that can positively affect the social fibre of the country. Burnside, an outspoken cultural advocate like her late husband, Jackson Burnside III, will also talk about the necessary shift needed to redefine the country’s outdated tourism model of sun, sand and sea into one that focuses on Bahamian Art, Culture and Heritage from the inside out, i.e. developed first from amongst the Bahamian people, then offered outwards to the visitor. The Orange Economy is a manual to understand that it is in the imagination of our artists and creatives that we find one of the most effective ways to seize opportunities in an era of disruptive technological change to become a force in the global knowledge economy.